This new game brought by BetSoftGaming appeared on stage in 2016. This slot introduces the participant in Irish mythology, to put it face to face with a fantasy world and extraordinary beings. It leads them to meet little green men with incalculable riches, who live in a world full of colors and extensive meadows covered in four-leaf clovers. It is aimed at pleasing lovers of video games with free spin, which are developed in the midst of magic and fantasy and expect to obtain spectacular prizes. This slot has 6 reels, 40 pay lines, and progressive jackpots. When completing a minimum of 4 places with Money Wheel icons in the sixth reels, the options to enter another phase of the game will be opened. This stage can turn the player into someone immensely rich, with the only spin the reels have been touched by magic, you can get up to x15 of the original investment, as well as, the tremendous opportunity to give a turn to the Super Wheel. In those turns, the winnings are amazing, because they can reach an x40 of the full bet, get a mini jackpot or continue to the Mega Reel. Upon entering this site, the cash prizes will become a reality, reaching up to x100 of the bet, the Giant, and the Colossal Jackpots. Wilds symbols can also be used, with the purpose of making a winning combination on any of the 6 reels. The Wild symbol has the same properties as the bonus of the sixth reels. Thanks to the help of the little leprechaun, you can get wonderful treasures, having to go to where the rainbow ends, to obtain them. From the hand of the goblin, will cross the green meadows and when they make their appearance the 4 symbols of the golden bonus, a total of 5 pots of gold will be uncovered. Each one contains immense riches, now you have to guess which of them the one that will give the immense fortune is. By hitting the Golden Bonus, you can get up to x20 of the total amount of the bet in each game. When you hit the icon of the wheel of fortune and is located on the sixth reels, you can immediately enter the traditional lucky wheel. There you can turn and get a credit that will multiply x15. To obtain wonderful gains, you can look for other options. One of them is when you can enter the super wheel or mega wheel, which will give the player the option of entering the game four progressive jackpots. To make bets, you must choose the currency that will be made and the amount of the bet on each line, since it is not possible to choose a single line. The smallest amounts that can be bet are coins of 0.02 and the limit value is 1 coin.Immediately, after making the bet you can choose to multiply the amount between 1 and 5 times, the bet for each line of payment. In the end, you can choose a bet for a minimum amount of 0.8 coins and a maximum of 200 coins. As for the progressive jackpots, so advantageous, the Charms and Clovers slot has 4 of them. With each of these jackpots, you can get up to 3,500 credits, with the help of luck. The Charms and Clovers online video slot machine is one of the highest payback player (RTP), which reaches 95 percent of the entire investment, a very beneficial amount. All symbols refer to the theme of enchanted forests and fantasy worlds, where the little green goblins are found. You can also see the stacked tables that are identified as “Bar”, the unmistakable jug full of Irish beer, the colorful rainbow, number 7 golden color and the characteristic icons that give luck, the clover, and horseshoe blue color. Other typical icons of the slots games are the 10, Q, J, K and A cards in striking colors and decorated with leaves. The symbol of the wheel of fortune is one of the most satisfying in the game. Through the icons of the game, you get numerous benefits, such as two kinds of free spins. This Charms and Clovers slot machine has 6 reels, which keep countless wonders hidden. The bonus is one of the most surprising, which is used for free spins. The charming elves allow access to two classes of Free Spins, which have multiple extra features, which will amaze you. To use the Pots of Gold bonus (Pots of Gold), when you have 4 icons with similar land identification and are located in the sixth reels, only, in this case, you will get 8 free spins. By accumulating the icons known as “Mega Symbol”, 8 spins will be achieved for free. When in character of the story, the colorful goblin, jump on the reels, you will immediately create the great 3 x 3 symbol on top of each of the reels. In the course of the game, certain combinations can be made, which will give extraordinary benefits to the player. One of these combinations is to join ordinary and large symbols, to earn excellent rewards. In each of these turns, splendid gold coins, identified as jingly, will be thrown to the reels by a mythical leprechaun. The jingly are referred to as Wild symbols in the game. During the game, you will hear typical Irish music that will keep the player in a constant entertainment and ready to dance. The design of the Charms and Clovers slot machine will tour places full of charm and mystery. The tiny elves with the classic dress and the characteristic red hair will lead the player to get fascinating rewards. By following the restless steps of these elves, the user will enjoy all the fun and at the same time, get a fortune. The graphics presented by the screen, show that the ingenious developers of BetSoftGaming, have entered the world of magic, to make a very striking animation and that captures the attention of the player. Now it is possible to download the game Charms and Clovers online for mobile devices and tablets, thanks to the hard work that has been carried out by BetSoftGaming staff. This version of the online game has some visual peculiarities that will captivate you and will not be able to take off from the screen of your Smartphone. But when playing on a tablet, the visual effects are more amazing, because it has a wonderful 3D design, which will turn the graphics into a quite impressive experience, which will include the viewer in the game. Live this adventure full of elves with red hair, pointed hats and surrounded by colorful rainbows is the funniest way to get excellent profits, uncovering pots with gold coins. The game takes place in the middle of an enchanted forest, which gives the player the option to go out with pockets full of coins. Having the opportunity to do the tour, for free, if you do not dare to risk money and with the same fun. This slot has 6 reels, 40 pay lines, and progressive jackpots. When completing a minimum of 4 places with Money Wheel icons in the sixth reels, the options to enter another phase of the game will be opened. This stage can turn the player into someone immensely rich, with the only spin the reels have been touched by magic, you can get up to x15 of the original investment, as well as, the tremendous opportunity to give a turn to the Super Wheel. In those turns, the winnings are amazing, because they can reach an x40 of the full bet, get a mini jackpot or continue to the Mega Reel. Upon entering this site, the cash prizes will become a reality, reaching up to x100 of the bet, the Giant, and the Colossal Jackpots. Wilds symbols can also be used, with the purpose of making a winning combination on any of the 6 reels. The Wild symbol has the same properties as the bonus of the sixth reels. Each one contains immense riches, now you have to guess which of them the one that will give the immense fortune is. By hitting the Golden Bonus, you can get up to x20 of the total amount of the bet in each game. When you hit the icon of the wheel of fortune and is located on the sixth reels, you can immediately enter the traditional lucky wheel. There you can turn and get a credit that will multiply x15. To make bets, you must choose the currency that will be made and the amount of the bet on each line, since it is not possible to choose a single line. The smallest amounts that can be bet are coins of 0.02 and the limit value is 1 coin. Immediately, after making the bet you can choose to multiply the amount between 1 and 5 times, the bet for each line of payment. In the end, you can choose a bet for a minimum amount of 0.8 coins and a maximum of 200 coins. By accumulating the icons known as “Mega Symbol”, 8 spins will be achieved for free. When in character of the story, the colorful goblin, jump on the reels, you will immediately create the great 3 x 3 symbol on top of each of the reels. In the course of the game, certain combinations can be made, which will give extraordinary benefits to the player. One of these combinations is to join ordinary and large symbols, to earn excellent rewards. In each of these turns, splendid gold coins, identified as jingly, will be thrown to the reels by a mythical leprechaun. The jingly are referred to as Wild symbols in the game. During the game, you will hear typical Irish music that will keep the player in a constant entertainment and ready to dance. The design of the Charms and Clovers slot machine will tour places full of charm and mystery. The tiny elves with the classic dress and the characteristic red hair will lead the player to get fascinating rewards. By following the restless steps of these elves, the user will enjoy all the fun and at the same time, get a fortune. 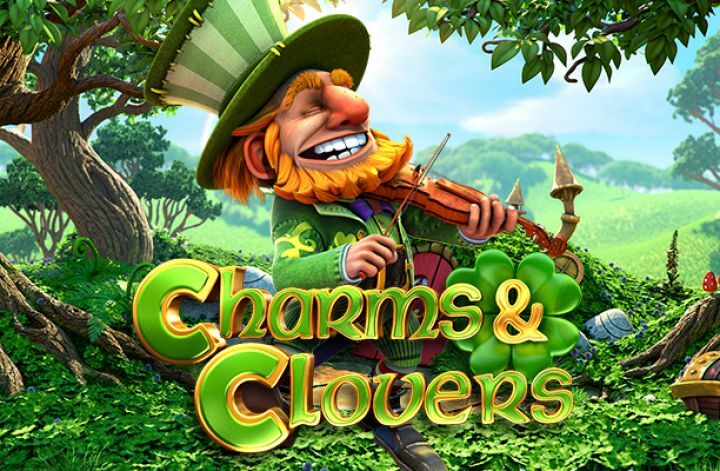 Now it is possible to download the game Charms and Clovers online for mobile devices and tablets, thanks to the hard work that has been carried out by BetSoftGaming staff. This version of the online game has some visual peculiarities that will captivate you and will not be able to take off from the screen of your Smartphone. But when playing on a tablet, the visual effects are more amazing, because it has a wonderful 3D design, which will turn the graphics into a quite impressive experience, which will include the viewer in the game. Live this adventure full of elves with red hair, pointed hats and surrounded by colorful rainbows is the funniest way to get excellent profits, uncovering pots with gold coins. The game takes place in the middle of an enchanted forest, which gives the player the option to go out with pockets full of coins. Having the opportunity to do the tour, for free, if you do not dare to risk money and with the same fun.